I’m giving the link below for Paul Brodie’s (USA) Get Published podcasts, in which I recently participated. In particular, this is a link for authors, especially beginning writers starting their journey and looking for clues about it all, as it covers different aspects of the writing and publishing process – and the marketing process that follows! http://traffic.libsyn.com/getpublishedpodcast/Get_Published_Podcast_Episode_132_Felicity_Pulman.mp3. 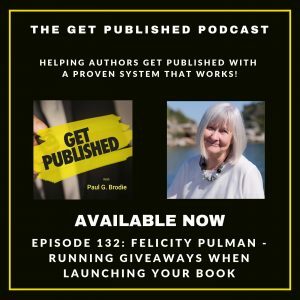 Felicity Pulman – Running Giveaways when Launching Your Book. Below I’ll also add a link to iTunes . https://itunes.apple.com/us/podcast/get-published-podcast/id1400407118 and a link to a quick video on how to leave a review if you’d like to do so: https://vimeo.com/281373818/cec678a564.